The Imperial Japanese Navy(hereafter IJN)'s tactics and weapon systems showed great diferences between the early stage and latter stage of the Pacific War. In the early stage, there was rationality, but the latter stage was predominated by emotionalism and there was no rationality in tactics and weapon systems. The IJN's war plan against U.S.Navy was a very systematic and rational one, named “Attrition Interception operation".（１） And in the early stage of the war, there was rationality and showed suplendid tactics of air-power projection from the sea to the land by carriers against Hawaii, Port Dawin and Ceyelon. But, in the latter stage of the war, IPN was occupied unrational thinking in their tactics and weapons, called suicide Kamikaze-Attack. 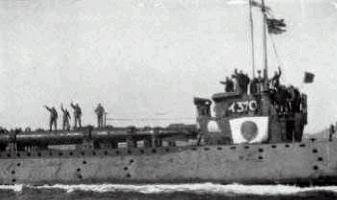 After the defeat of Gadarucanal, especially after the Leyte Gulf, the IJN's tactics and weapon systems were greatly changed and lost rationality. Why there arosed such a great diference in the same organization. Why JIN could change their tactics for Kamikaze so easily and quickly in the latter stage of the War. What kind of military theory influenced on this rational strategy and on the later unrational strategy. The JIN's theory and thinkings were influenced from three stratgists and thier writings, Sun Tzｕ's Art of War, Alfred Thayer Mahan's Naval Strategy and Japanese ancient Tｏsenkyo〔Sutra of Combat〕.（２） This paper will consider how the IJN's tactics and weapon systems were established and changed influenced by these three strategist's thinking. And also why Japanese Navy could change her tactical concepts so quickly and easily at the latter stage of the War from military and naval doctrine and thinking. 1. Despatch submarines to the area where the American fleet was located to　monitor its movements and should it set out, shadow it to keep track of　its subsequent movements,while in the meantime attacking it repeatedly　to diminish its strength. 2 Deploy a land-based naval air craft in the South Sea Mandated Islands　to attack the enemy fleet, once it came within range of destruction,from　the air in cooperation with the carrier-borne planes to further reduce　the enemy's strength. break excute a decisive battle with the entire force centered around　battleship units to annihilate the enemy. In about 1935 the type 94 carrier bomber(D1A1,“Susie"), a great advance over previous models, was officialy adapted. At about the same time, longrange flying boats, land-based bombers and similiar craft would be effective adjuncts of carrier-based forces. By 1936, the Type-96 land-based medium bomber(G3M2, “Nell"), which had a range of 6,000 km and was capable of both torpedo attack and bombing, was ready for service. After the notification of renunciation of the Washington Treaty, greater emphasis was given to land-based naval air power on the decision “try to make the most of the geographical advantage which only we have.”（８） The Third replenishment Plan of 1937 increased the air arm by 14 groups to 53 groups. The Fourth Replenishment plan of 1939 added 75 for a total of 128 groups. The Fifth Replenishment plan of 1940 provided 160 groups for a grand sum of 288 groups. In the Fifth Replenishment Plan included a major expansion of the land-based air forces and called for the deployment of large and medium-size attack planes mainly in the “Micronesia" or where they expected to be a decisive battle area.（９） According to these devepolements, in 1938 a “Combined Naval Air Wing Rule" was instituted to ensure efficient operation of the land-based naval air. In January 1941 the Eleventh Naval Air Fleet was newly organized from land-based air squadrons, to take an unified command of the land-based air units. In April of the same year, the First Air Fleet was set up to coordinate carrier based aircraft in large numbers.（１０） Thus, the major role in the interception-attrition operation shifted from submarines and advanced body of torpedo squadron(cruisers and destroyers) to aircraft. The first Kamikaze(Special Divine Winds) was organized at the Mabalacat air field in Philippines on 20 October 1944, by Vice Adimral Onishi Takijiro, father of the Japanese naval air, against a U.S. Fleet in Leyte Gulf. Five Zero fighters, each carrying a 250 kilogram bomb, attacked U.S.carriers aiming to stop air operation for a while. But after this, Kamikaze attack became ordinary in the navy. For the next 10 months, from Leyte until Japan's surrender in August 1945, the IJN devoted 2525 pilots and Army devoted 1388 pilots.（１６） These suicide attack squadrons were formed and also weapons were developed officially, but applications to Kamikaze was individual decision, and these suicide attacks were promoted by young officers. Why Japanese Navy could change so easily from calculated and very logical interception-attrition tactics to Kamikaze tactics? 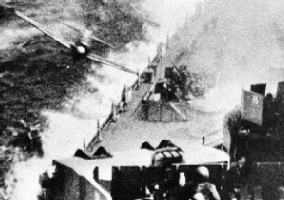 Why Japanese could continue Kamikaze attacks? Many reasons are introduced concerning this, but I would like point out 6 factors. First is originated in the Japanese climate and religion of Sintｏ and Budism, Second is the strong patriotic spirit and loyality from their “Mura(village)" consciousness which is rooted from isolated small society. The third is a sense of family in the household. From there the consciouness of “Haji" and “On" which was mentioned by Ruth Benedict in “The Chrysanthemun and the Sword".（２０） The fourth motivation of Kamikaze is the tradition of the Samurai-spirit and affection to the village(small community) forced them to die themselves when they defeated, they try to vanish with their villagers and village. Fifth is the education of the nation of the before war. It was teached that the heads of the household si father and the father of the Japan is the Emperor.But I would like to discuss the JIN's strategic thinking and strategists who influenced this transition of tactics. Satｏ was the most celebrated expositor of Sun Tzｕ he wrote the“Comprehensive Translation of Sun Tzｕ", and in the forward he stated that Sun Tzｕ's Art of War that from ancient times to now, among the western and eastern arts of war, Sun Tzｕ's Art of War was the most profound and best book for strategy,（２２） and if you wish to study profound and most effective art of war, you must study Sun Tzｕ and Sun Lｕeh.（２３） In 1892, he wrote Teikoku kokubｏron(Imperial Nationl Defence) applying Sun Tzｕ's Pacifism. In this book, he insisted that the true defence was never to let the foe land.（２４） He emphasized sea defence and foresaw a maritime developing, he denied development for continent. Later Teikoku-kokubｏron become the fundamental text for naval officer, and also it was widely circulated amang the people. After World War �T, Mahan's maxim “The sound general principle that the enemy's fleet, if it probably can be reached, is the objectives paramount to all others, because the control of the sea, by reducing the enemy's fleet, is the determining consideration in a naval war"（２９） prevailed in the IJN. Meanwhile, after World War �T, the IJN ranked as third navy of the world and called “Big three." By this pride and confidence, there arose strong wishes for develop-ment of their own strategy and tactics. This tended to consider the ancient masters relevant to modern and Sun Tzｕ's Art of War was reviewed to develop new strategy and tactics. In 1917, General Ochiai Toyosaburｏ wrote Comprehensive Sun Tzｕ, insisting that “It is regretable that western thinking dominates Japan and eastern masters were neglected. We must review ancient oriental masters to develop our own strategy and tactics.（３０） The navy assigned Sun Tzｕ as a selected book to distribute and to read to every ship and facility. 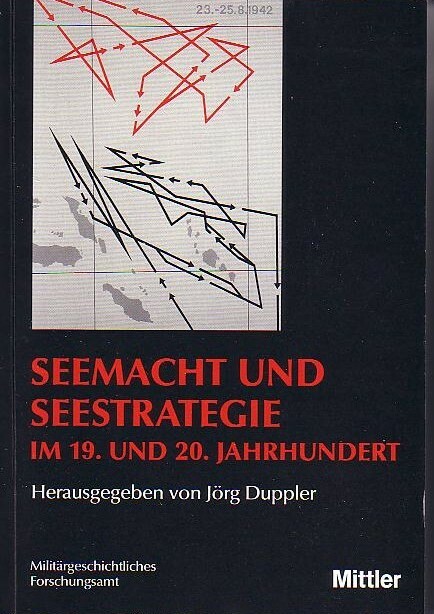 In text or speeches “If you know the enemy and know yourself, you need not fear the result of a hundred battles", or “As water has no constant form, there are in war no constant conditions"（３１） were often quoated to emphasize the importance of intelligence and to planners of the remind a importance of creating a new strategy and tactics. Following is the list of distribution of the three famous books, Mahan's Naval Strategy, Clausewitz's On War, and Sun Tzｕ's Art of War. Though Clausewitz's On War and Mahan's Naval Strategy were distributed only to schools, regional-headquarters and squadron-flagships, but Sun Tzｕ's Art of War was distributed even to destroyers. Following distribution list（３２） shows how the JIN had a higher regard for Sun Tuz's Art of War for Clausewitz's On War and Mahan's Naval Strategy in early 1930s. (2)If You know the enemy and know yourself, you need not fear the result of a hundred battles. (3)With many calculations, one can win, with few one cannot. (1)Fight without fear, because we have justic and right will win in the end. (3)For conduct of war, you must not caluculate, just do your best. (4)Do not fear a superior enemy, because even a small insect can win big enemy sometimes. This teach us that even inferior force, we could get a victory. Thus Sun Tzｕ's Art of War was venerated as a classic, and gradualy it was considered out of date by the nationalistic younger officers, and thus hardly worth study in an era of mechanized weapons. Forthermore, an Ultra nationalistic mode made Emperor as a “Living God", and also made Japan as a “Nation of God". As a living Deity his will cannot be questioned. His commmands are hallowed. Consequently, Japanese army and navy repeated hypnotically “We must win as the Gods have given us victory in the past, so will they give us victory in the future". Thus Imperial Armed Forces attached more importance to improvement of tactical skill than conduct of war or strategic thinking, thus gradually the spiritual readiness was formed among the Imperial Armed Forces. In late 1930s, “Kｏgun (Emperor's Armed Forces)" concept governed the navy, so moral, spiritual factors were emphasized. And for conduct of war, fair, square and with Makoto(Honesty and Sincerity) were given importance as kｏgun military doctrines.（３５） This tended to diminsh logical thinking, and only loyality, spiritual strength and devotion to the Emperor were stressed, and gradually Sun Tzｕ's reasonable and rational thinking was ignored. The historical process that brought Japan into the Pacific War includes many elements, such as the conclusion of the Tripartie Pact, Japan's fascination with Germany's overwhelming victories at the western front, and American pressure on Japan, particularly the reduction of oil supplies. However, that was mainly based on two factors. One was the so-called “gradual decline" argument, which held that if no positive action was taken that the navy would run out of fuel bit by bit and the ratio of its forces to those of America would worsen rapidly as time went on. The other, more important, was Japan's fascination with Germany's overwhelming victories and miscaluculation, overconfidence in the interception-attrition operation. Japan entrusted her destiny to the leaders who did too few caluculations before war and lost war, against Sun Tzｕ's maxim “With many calculations, one can win;with few one cannot".（４１） And also, Japanese political and military leaders were to count on victory by Germany. However, from one month before the Japanese declaration of war, the German army was surfering in Moskva, and on 5th of December, Soviet army begin offensive operation in the East front and German army were already defeated. If Japanese politico-military leaders applied Sun tzｕ's maxim that “If you know the enemy and know yourself, you need not fear the result of a hundred battle",（４２） knowing of Germany's defeat in Moskva, the IJN should not have attacked Pearl Harbor. They knew neither their enemies nor themselves. Until the Second World War, Clausewitz's principles “War is an act of force, and there is no logical limit to the application of that force." “A clash of forces freely operating and obedient to no law but their own," eventually reachs destruction.（４３） This total destruction of one side by the other dominated the world, and created great destruction to the world. But after the termination of cold war, increse of low density conflicts, and a usage of the armed forces faced many limitations. In such a environment, Sun Tzｕ's maxim “subdue the enemy without fighting" increasing, and his concentrated essence of wisdom on the conduct of war, more effective than western military theories to accomplish national object, become all the more important as an “Art of War(Peace)”for the Twenty-first Century". 1 Ref. my “Japanese Naval Preparation for World War �U"(U.S.Naval War College　Review, vol.LIV, No.2, Spring 1991), pp.63-81. 2 Tｏsenkyo is the oldest Japanese “Art of War," which was writen by Ooe no　Makifusa(1041 -1111). For Tｏsenkyｏ refer: Nakashiba Suejun, Tｏsenkyｏ no　Kenkyｕ〔Study on Tｏsenkyｏ〕(Miyakoshi-Taiyｏdｏ, 1944). 3 Before the Second World War, Japanese Defence Plan was consist of “Teikoku- Kokubｏ-Hｏsin(Imperial Defence Policy)" which generally designated foundamental Defence Policy and potential enemy, and “Shoyｏ-heiryoku(Required Forces by Defence Policy)"and “Teikokugun no Yｏhei-kｏryｏ(Imperial Defence Guidline)". These were reviced in 1818, 1923 and 1936. 4 Bｏeikenkyｕsho(National Institute for Defence Studies:hereafter NIDS). ed.,Senshi Sｏsho Series Hawai Sakusen〔The Hawaii Operation〕(Asagumo Shinbunsha,1979), p.38. 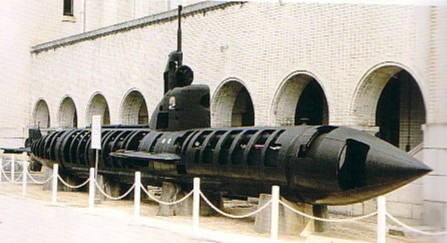 7 NIDS.ed., Senshi Sｏshi Series Sensuikan Senshi〔History of the Japanese Submarines〕 (Asagumo Shinbunsha, 1979), p.36. 8 “Kokubｏ Shoyｏheiryoku〔Required Forces by Defence Policy〕",Teikoku-Kokubｏ-Hｏshin-Tsuzuri〔Imperial Defence Policy File〕Febrary to May,1936, NIDS Archives. 9 Kaigun Gunsenbi, Ibid., vol.�T, pp.511-543, 581-583, 542-543. 10 Kaigun Hensan Iinkai〔Navy editing Commitee〕,ed.,Kaigun〔Navy〕 Vol.13:Kaigun　kｏkｕtai〔Naval Air Corps〕(Seibunsha, 1981), p.60. 11 Reliable sources give differing estimates of the number of Japanese aircraft on this occasion. According to Capt.Nakazawa of the Air Staff of the Combined Fleet, whose numbers were 136 at Saipan, 35 at Truk, 109 at Biak area, 155 Palau, total 435 on 11 June;see NIDS. ed.,Senshi-Sｏsho Mariana Oki Kaisen〔The naval battle off the Marianas〕(Asagumo Shinbunsha, 1968), pp.520-21. While Capt.Toshikazu Omae　estimated a total of 540 planes as follows:4 on Chichijima, 35 on Saipan, 67 on　Tinian, 70 on Guam, 67 on Truk, 40 on Yap, 134 on Palaus, 25 on Davao, 40 on　Cebu, 42 on Kaoe and Wasile, Harumahera, and 16 at Sorong and Babo(Vogelkop);see Samuel E.Morison, Unitet States Naval Operations in World War �U, 15 vols. (Boston: Little Brwon, 1947-1962), vol.8:219. 12 Minoru Genda, Kaigun Kｏkｕtai Shimatusi Sentｏhen〔A record of how it was in the　naval air corps:Section on Combat〕(Bungeishunjｕ-Sha,1962), p.224. 13 Mariana Oki Kaisen, Ibid., pp.566-637. 14 Alfred Thayer Mahan,Naval Strategy(Boston:Little Brown and Co,1911), pp.139,435. 15 Philip A.Crowl,Alfred Thayer Mahan:The Naval Historian,Peter Paret,ed.,Makers of Modern Strategy:From Machiavelli to the Nuclear Age(Princeton,N.J. :Princeton　University,1978), p.455-456. (Sydeny, 1982) and Morimoto Tadao,Totukｏ〔Special Attack〕(Bungeishunjｕ Sha 1992). Imperial Staff･Combined Fleet(Asagumo Shinbunsha, 1971),vol.�W, pp.327-347. Kai, 1988) and Kaiten Editing Committee, eds., Kaiten(Editing Committee, 1982). 19 Kaigun Gunsenbi, Ibid., vol.�U, pp.184-189. 20 Concerinig the Japanese habits of acting and thinking refer to Ruth Venedict,Chrysanthemum and the Sword:Paterns of Japanese Culture(Tokyo:Charles E. Tuttle　Co.1974). 21 Samuel B.Griffith, Sun Tzｕ's the Art of War(Londn:Oxford University Press,1963), Chpter 3 Offensive Strategy, p.79. 22 Satｏ Tetutarｏ, Iyaku Sonshi〔Translation of Sun Tzｕ〕(Naval War College,1918),p.1. 23 Satｏ Tetutarｏ,Kaigun Senri-gaku〔Theory of Naval Operations〕(Naval War College,1912), p.27. 24 Satｏ Tetutarｏ, Teikoku Kokubｏron〔Imperial Defence〕(Suikｏsha, 1892), p.182. 25 Akiyama Saneyuki Kai Ed., Akiyama Saneyuki〔Akiyama Saneyuki-Kai,1933), p.329. 27 Carl von Clausewitz, Trans. Hans W.Gatzke, Principles of War(Pennsylvania:The　Stockpole Company, 1960), p.45. Maritime Staff College, 1962), p.439. 29 Alfred Thayer Mahan, Naval Strategy ; Compared and Contrasted with the Principles and Practice of military operations on land(Boston:Little brown, 1911),p.189. 30 Toyosaburｏ Ochiai, Sonsi-Reikai〔Comprehensive Sun Tzｕ〕(Gunji Kyｏiku Sha,1919),p.2. 31 Sun Tzｕ's Art of War, Chapter 3 Offensive Strategy, p.77, Chapter Weakness and　Strengths, p.101. (Imperial Navy Education Bureau, 1931), p.11, p.20. 1. Consider loyalty their essential duty. 5. Should make simplicity their aim. 34 Sasamori Junzｏ,ed.,Nihon no Seiten〔Pure Japanese Sutra of Combat〕Tｏsenkyｏ　(Nihon-Shutupan　-Hｏsｏkikaku,1992), pp.49,52,59,63,104-105,159-160. 35 For Kｏgun concept refer, Hillis Lory, Japan's Military Masters (Viking Press,　1943. Reprinted, Greenwood Press, 1973). road to the Pacific War, Appendix volume, Documents section)(Asashi Shimbunsha, 1988), p.512, p.545. 39 Fukudome Shigeru, Shikan Shinjuwan kｏgeki(A private view of the Pearl Pearl　Harbor Attack)(JiyｕAjia Sha,1955), p.135. 40 Fukudome Shigeru, Kaigun no Hansei〔Reflection on Pacific War〕(Nihon Shuppan　Kyｏdｏsha, 1951), pp.119-120. 41 Sun Tzｕ's Art of War, Chapter 1 Estimates. 42 Ibid., Sun Tzｕ the Art of War, chapter �V, Offensive Strategy, p.77. 43 Peter Paret, “Clausewitz", Peter Paret ed. Makers of Modern Strategy - From　Machiavelli to the Nuclear War(Princeton:Princeton University Press, 1986),pp.179-180.